Dimensions: 16" x 21" x 5" (w/h/d), handle drop is approx. 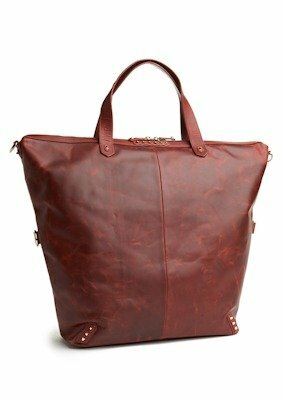 15"
This big Ava Rose tote has double handles with top zip closure, has a distressed leather finish and a detachable shoulder strap with outer zip pocket. The hardware is rose gold. The interior includes two slide pockets and one zip pocket. Sleeper bag included. Also available in aubergine. Guaranteed authentic, 1 available.